The Administration Signed a Contract to Bring on 7,500 Border Personnel. It's Hired Just 15. The Trump administration is seeing a surge in applicants to fill the additional Border Patrol jobs that the president has demanded, but the agency is still losing more employees than it can bring on board. 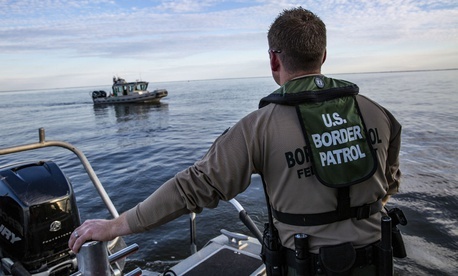 Applications to serve as a Border Patrol agent tripled between fiscal years 2013 and 2017, according to a Government Accountability Office study, to 91,000 potential candidates. That marked about a 33 percent increase from the previous year. At Customs and Border Protection’s other main law enforcement arm, the Office of Field Operations, applications have nearly quadrupled in the same timeframe. The increases came as CBP boosted its recruiting efforts after Trump issued an executive order calling for 5,000 new Border Patrol agents. Still, CBP is struggling to bring those candidates on board. Acceptance rates at Border Patrol have more than tripled since fiscal 2015, but even in fiscal 2017, just 1.36 percent of applicants were given jobs at the agency. In the first half of fiscal 2018, the Border Patrol nearly doubled the number of employees it brought on board compared to the same period in fiscal 2017. Still, the agency failed to keep up with attrition and saw a net loss of 76 employees. The Border Patrol maintained a staffing level nearly 7,000 agents below that sought by President Trump in fiscal 2017. It also saw a net loss of employees that year. GAO recommended that CBP better track why employees are leaving and use it to inform the agency’s retention efforts. CBP is making some improvement, however, GAO found. The agency hired law enforcement officers at a 20 percent faster rate in fiscal 2017 compared to two years earlier, though the process still took an average of 318 days. For Border Patrol agents, the time-to-hire spiked 11 percent in fiscal 2017 compared to the previous year, taking an average of 274 days. The successes CBP has seen stem from multiple facets of the agency’s push to keep up with attrition and fulfill Trump’s mandate. For customs officers, CBP spent $4.3 million on recruitment incentives in fiscal 2017. That marked a whopping 548 percent increase over fiscal 2015. Most of its less desirable locations are no longer experiencing staffing decreases, GAO found. Border Patrol does not use recruitment incentives, officials said, because it has led to resentment among employees who did not receive those offers. CBP has also dramatically increased recruiting events, from 905 three years ago to 3,000 last year. It created a task force to develop recruiting strategies and make the process a more coordinated effort. The recruitment budget has doubled over the last three years, and the task force is now finalizing a recruiting plan through fiscal 2024. The task force has, for example, focused on recruiting at college athletic events. The agency has also made improvements in its dozen-step hiring process, leading to the faster results. CBP has made revisions to its polygraph, though still just 26 percent of potential Border Patrol agents passed it last year. It has also made adjustments to its physical testing and has received direct hire authority from the Office of Personnel Management for law enforcement jobs. CBP has also signed a contract with Accenture worth up to $297 million to help with the recruiting and hiring process, which GAO said “seems promising” but is still too early to definitively assess. Accenture has collected $43 million so far and onboarded around 600 new employees. In the first year of the contract, CBP is paying the vendor $40,000 per new employee hired. The Homeland Security Department’s inspector general last year questioned the need for the hiring at all, finding CBP and Immigration and Customs Enforcement have failed to demonstrate an operational justification for the dramatic workforce augmentation.